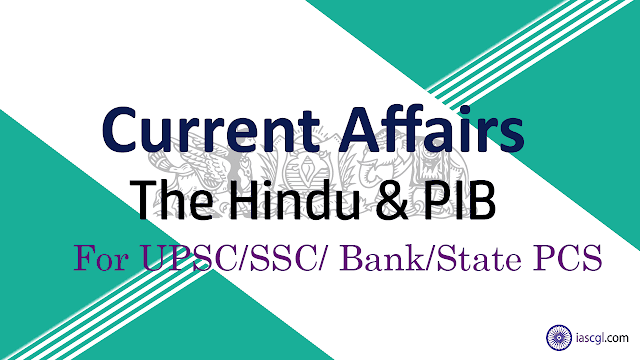 28th September 2018, Current Affairs and News Analysis for UPSC Civil Service Examination, SSC CGL and State Civil Service Examinations. The Supreme Court, in a majority opinion, upheld Aadhaar as a reasonable restriction on individual privacy that fulfils the government’s “legitimate aim” to provide dignity to a large, marginalised population living in abject poverty. The Constitution does not exist for a few or minority of the people of India, but ‘We the People’. Aadhaar is a document of empowerment. An unparalleled identity proof. A document that cannot be duplicated, unlike PAN, ration card, and passport. It is better to be unique than the best. The best makes you number one, but unique makes you the only one. Technology had become a vital tool for ensuring good governance in a social welfare state. Schemes such as the PDS, scholarships, mid-day meals and LPG subsidies involve a huge amount of money, and fool proof Aadhaar helped welfare reach the poor. Majority opinion upheld the constitutionality of Aadhaar. Justice D.Y. Chandrachud wrote a sharp dissent, declaring Aadhaar unconstitutional. He said that if the requirement of Aadhaar is made mandatory for every benefit or service which the government provides, it is impossible to live in contemporary India without Aadhaar. The legitimate aim of the state to provide dignity to the poor could have been fulfilled by adopting less intrusive measures. Why has Aadhaar been made the sole repository of identification? He said efficiency in governance could not steamroll fundamental freedoms. If so, there was a danger of a society crossing the line which divided democracy from authoritarian cultures. The entire Aadhaar programme, since 2009, suffers from constitutional infirmities and violations of fundamental rights. The enactment of the Aadhaar Act does not save the Aadhaar project. The Aadhaar Act, the Rules and Regulations framed under it, and the framework prior to the enactment of the Act are unconstitutional, he held. Aadhaar is a reasonable restriction on individual privacy. The Supreme Court quashed or read down several provisions in the Aadhaar Act in order to de-fang any possibility of the state misusing data. For one, the court held that authentication records should not be retained for more than six months. It declared the archiving of records for five years as bad in law. It also prohibited the creation of a metabase for transactions. 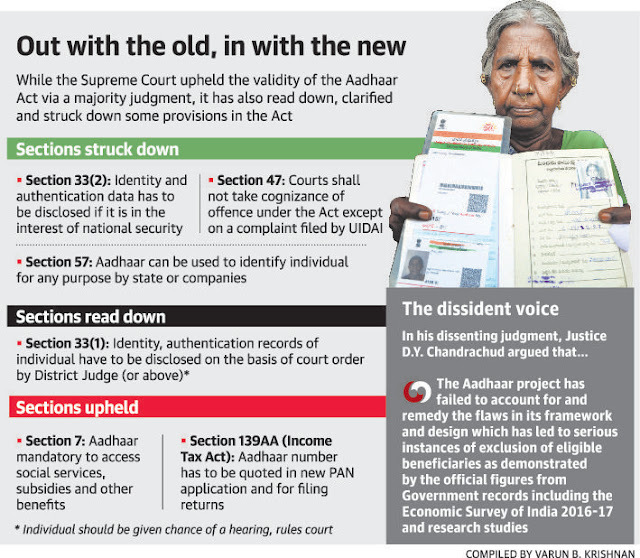 The Supreme Court said neither were individuals profiled nor their movements traced when Aadhaar was used to avail government benefits under Section 7 of the Aadhaar Act, 2016. The statute only sought minimal biometric information, and this did not amount to invasion of privacy. Countering the argument that the Aadhaar regime would facilitate the birth of a surveillance state, Justice Sikri wrote that Aadhaar exhibited no such tendencies. Authentication transactions through Aadhaar did not ask for the purpose, nature or location of the transaction. Besides, information was collected in silos and their merging was prohibited. The authentication process was not expanded to the Internet. The collection of personal data and its authentication was done through registered devices. The Authority did not get any information related to the IP address or the GPS location from where authentication was performed. The Aadhaar structure makes it very difficult to create the profile of a person, Justice Sikri reasoned. The absence of a legislative framework for the Aadhaar project between 2009 and 2016, before the Aadhaar Act came into existence, left the biometric data of millions of Indian citizens exposed to danger. Justice Chandrachud did not agree with Justice Sikri’s majority view that since information was collected in silos in Aadhaar, potential surveillance or profiling by the state or private entities was impossible. He countered that when Aadhaar was seeded into every database, it became a bridge across discreet data silos, which allowed anyone with access to this information to re-construct a profile of an individual’s life. Section 7 of the Aadhaar Act mandates that individuals should produce Aadhaar to access social services, subsidy, benefits, etc. Moreover, it is clearly declared that expenditure incurred in this respect would be from the Consolidated Fund of India. The majority opinion on the Constitution Bench that the Aadhaar Act was a Money Bill prevailed, but the dissenting judgment by Justice D.Y. Chandrachud questioned how a statute about an identity proof, Aadhaar, can be possibly passed as a Money Bill. Justice A.K. Sikri pointed to Section 7 of the Aadhaar Act which required authentication by Aadhaar card if beneficiaries wanted to access subsidies, benefits and services. Justice Sikri reasoned that since all these were welfare measures sought to be extended to the marginalised sections, a collective reading would show that the purpose is to expand the coverage of all kinds of aid, support, grant, advantage, relief provisions, facility, utility or assistance which may be extended with the support of the Consolidated Fund of India with the objective of targeted delivery. In short, the majority view justified that Aadhaar was vital to ensure that government aid reached the targeted beneficiaries, and hence, the Act was validly passed as a Money Bill. A Money Bill must deal with the declaring of any expenditure to be expenditure charged on the Consolidated Fund of India. Section 7 does not declare the expenditure incurred to be a charge on the Consolidated Fund. It only provides that in the case of such services, benefits or subsidies, Aadhaar can be made mandatory to avail of them, Justice Chandrachud countered Justice Sikri’s view. He also pointed out that the other sections of the Aadhaar Act which dealt with several aspects relating to the Aadhaar numbers were alien to the scope of Article 110 of the Constitution which defined a Money Bill. 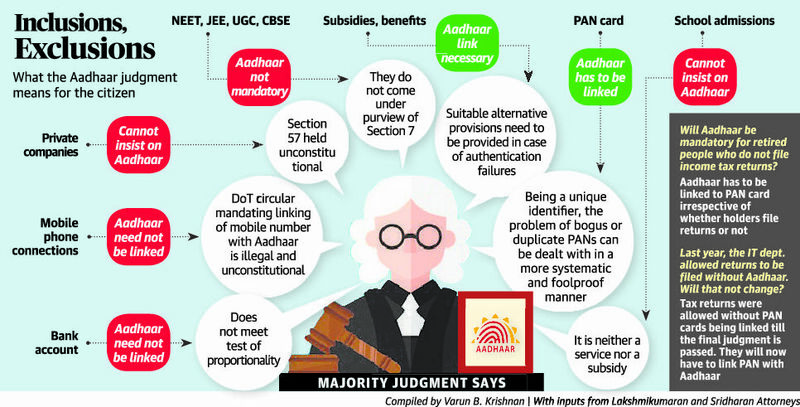 The majority opinion upheld the PAN-Aadhaar linkage, but declared linking Aadhaar with bank accounts and mobile SIM cards unconstitutional. The Election Commission may resume the voluntary linking of voter identification cards with the Aadhaar database, given that, prima facie, the judgment by the Supreme Court’s five-judge Bench does not have any adverse remarks on the issue. The court insulated children from the Aadhaar regime. The card was not necessary for children aged between six and 14 under the Sarva Shiksha Abhiyan as right to education was a fundamental right. Statutory bodies such as the CBSE and the UGC cannot ask students to produce their Aadhaar cards for examinations like the NEET and the JEE. Permission of parents and guardians was a must before enrolling children into Aadhaar. Once they attained the age of majority, children could opt out of Aadhaar. The Supreme Court held the portion, which gives a free hand to private entities to demand Aadhaar from individuals, unconstitutional. Section 57 allows not only the state but also any body corporate or person or private entity to demand Aadhaar from citizens for the purpose of identification. This provision had offered statutory support to mobile companies and private service providers to seek individuals’ Aadhaar card for identification purposes. A mere contract between a private entity and an individual was not enough to demand Aadhaar from the latter. The resident has been recognised as being at the heart of the project, and they have gained new rights that help them assert their ownership over their data. It will bolster good governance, and the delivery of services to the poorer sections of society. Lakhs of people would continue to be denied their universal rights for not having Aadhaar. The majority opinion in the Aadhaar verdict is silent on deleting biometric data already collected by phone companies. The judgment would help little in protecting the right to privacy because the Centre had privatised or outsourced many of its responsibilities. Such companies would have access to Aadhaar data. The Supreme Court ruling that Aadhaar is not mandatory for opening bank accounts could affect online opening of accounts. The bankers say that since there are no other officially valid documents apart from Aadhaar for use digitally, accounts cannot be opened online if the customer decides not to share the number. A Constitution Bench of the Supreme Court on Wednesday modified a 2006 judgment requiring the State to show quantifiable data to prove the “backwardness” of a Scheduled Caste/Scheduled Tribe community in order to provide quota in promotion in public employment. It gives a huge fillip for the government’s efforts to provide "accelerated promotion with consequential seniority" for Scheduled Castes/ Scheduled Tribes (SC/ST) members in government services. The apex court also turned down the centre’s plea that overall population of SC/ST be considered for granting quota for them. Justice Rohinton Nariman held that this portion of the M. Nagaraj judgment of another five-judge Constitution Bench in 2006 was directly contrary to the nine-judge Bench verdict in the Indira Sawhney case. 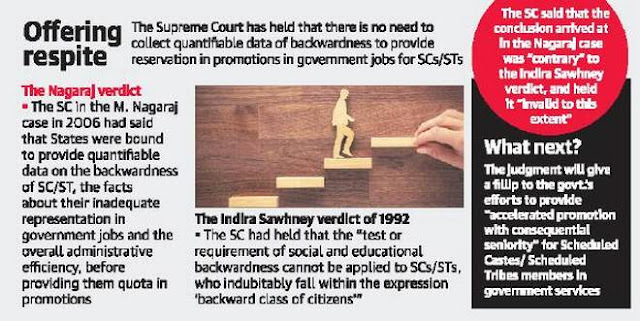 In the Indira Sawhney case, the Supreme Court had held that the test or requirement of social and educational backwardness cannot be applied to Scheduled Castes and Scheduled Tribes, who indubitably fall within the expression ‘backward class of citizens’. Justice Nariman pointed out that the Presidential List for Scheduled Castes contains only those castes or groups or parts as untouchables. Similarly, the Presidential List of Scheduled Tribes only refers to those tribes in remote backward areas who are socially extremely backward. The whole object of reservation is to see that backward classes of citizens move forward so that they may march hand in hand with other citizens of India on an equal basis. This will not be possible if only the creamy layer within that class bag all the coveted jobs in the public sector and perpetuate themselves, leaving the rest of the class as backward as they always were, Justice Nariman said and upheld Nagaraj’s direction that creamy layer applied to SC/ST in promotions. It said that when a court applies the creamy layer principle to Scheduled Castes and Scheduled Tribes, it does not in any manner tinker with the Presidential List under Articles 341 or 342 of the Constitution of India. The caste or group or sub-group named in the said List continues exactly as before. It is only those persons within that group or sub-group, who have come out of untouchability or backwardness by virtue of belonging to the creamy layer, who are excluded from the benefit of reservation. The Union Cabinet approved increasing the government’s ownership in the Goods and Services Tax Network (GSTN) to 100% from the existing 49% and also change the existing structure in line with a transition plan. After the restructuring of GSTN, its ownership will be shared equally between the Center and the States. The share of each state will work on a proportionate basis. GSTN provides the new indirect tax system IT Infrastructure for GST. At present, the Center and states have 49 percent stake in GST Network. The remaining 51 percent stake is with five private financial institutions- HDFC Ltd, HDFC Bank Limited, ICICI Bank Limited, NSE Strategic Investment Company and LIC Housing Finance Limited. The GSTN board will start the acquisition of the equity held by the private companies. By changing the existing structure of the Board, it will include three directors from the Central and the States, three other independent directors and one chairman and one CEO nominated by the Board. Thus, now the total number of directors will be 11. GSTN was incorporated on March 28, 2013 as a private limited company by the UPA Government. This increase in duty on imports with the already depreciating rupee would be quite a point of worry for the importers. However, this hike in duty may not impact importers who procure from countries with which India currently has beneficial free trade agreements. Astra is India's first indigenously built wind-to-air missile beyond the boundary. It has been developed by DRDO. This advanced missile fighter gives the drivers the ability to target enemy aircraft and kill them from a distance of 80 kilometers. DRDO has developed the 'Arsenic' missile to install Mirage 2000 H, MiG-29, Sea Harrier, MiG-21, HAL Tejas and SU-30 aircraft. In this, solid fuel propellants are used. A fibre optic gyroscope (FOG) senses changes in orientation based on the interference of light which has passed through a coil of optical fibre. Terminal guidance refers to any guidance system that is primarily or solely active during the terminal phase, just before the weapon impacts its target. Inertial Guidance uses sensitive measurement devices to calculate the location of the missile due to the acceleration put on it after leaving a known position. Active radar homing (ARH) is a missile guidance method in which a missile contains a radar transceiver and the electronics necessary for it to find and track its target autonomously. The Punjab government in collaboration with the World Health Organization has launched a “’micro strategic plan” to eliminate malaria from the State by 2020. Punjab is the first State in the country where the WHO will collaborate for elimination of malaria. It would provide technical support to the State to achieve the set target. The State is committed to micro-level surveillance under which each and every reported case of malaria would be investigated and remedial measures undertaken to prevent its further spread. Following a plea challenging the environmental clearance granted to the Chardham highway project, the National Green Tribunal constituted an oversight committee to look into the issue. The independent committee will consist of representatives from the Ministry of Environment, Forests and Climate Change (MoEF&CC), the Forest Research Institute and others. The directions came while the green panel was hearing a set of pleas challenging the construction of the Chardham highway project, stating that the project will have adverse environmental effects. What is Chardham Highway Project? It is a proposed two-lane (in each direction) express National Highway with a minimum width of 10 metres in the state of Uttarakhand. The proposed highway will complement the under development Char Dham Railway by connecting the four holy places in Uttarakhand states includes Badrinath, Kedarnath, Gangotri and Yamunotri. The project includes 900 km national highways will connect whole of Uttarakhand state.